Moon Tides: How does the Moon affect the Tides? What causes the Tides? Gravity is one major force responsible for creating tides. The gravitational attraction between the earth and the moon causes the water on the side of the earth facing the moon to draw the water closer to the moon, while inertia attempts to keep it in place. The sun also has a major impact, but due to it’s distance from earth, the moon is the stronger of the two influencers on tides. The interaction of the Sun and Moon and the changing angles create changes in the tidal bulges. According to the NOAA article, where much of this information is taken from, the rhythm of the tides change throughout the year due to the changing position of the earth in relation to the sun. When the Sun and Moon are in alignment (at the Full and New Moons) the solar tide has an additive effect on the lunar tide, creating extra-high tides and very low tides, (called Spring Tides) then a week later, when the Sun and Moon are at right angles (known as “squares” in astrology) the solar tide partially cancels out the lunar tides, which moderates everything (known as Neap Tides). During each month, there are two sets of Spring Tides (astrological “opposition” and “conjunction”, Full and New Moon respectively) and two sets of Neap Tides (astrological “squares” corresponding to First Quarter and Last Quarter Moons). Then, there’s also the moon’s elliptical path around the Earth, which creates a changing distance between them. Once a month, when the moon is closest to the Earth (at perigee) the tide forces are higher, then two weeks later, when the moon is farthest from the Earth (at apogee), the lunar tide forces are less and the tidal forces are less than average. Last night I was reading Rediscover Catholicism by Matthew Kelly in preparation for a book study on Saturday morning. He made a comment that in the time of Francis of Assisi, Church had become a practice of habit instead of a true conviction and spiritual connection. Seems to me that we’re in a time like that right now. Of course, there are the core groups of Dynamic Catholics that are fully engaged in the practice of their faith, but sometimes it gets discouraging to look at the trends of attendance and growth in the church. And the really scary statistics of how many teenagers leave the church after Confirmation. However, there’s always hope! And the Dynamic Catholic Institute is an organization that I think embodies the hope for the future. Just imagine that it would mean to have programs around these life-moments, Catholic-Moments that are the best of the best. It could totally revitalize the experience of Catholics around the world… re-opening their eyes to the beauty and genius of their faith. It’s a future I will do whatever it takes to create. What about you? One of the trickiest things about a non-verbal learning disability is the inability (or difficulty with) learning by seeing. We’re so used to teaching people how to do things by saying “watch me” or “watch this.” But for a person with NVLD, that doesn’t really help at all. Case in point. Sometime ago our son told me that he couldn’t figure out how to get the cord back on properly after using the vacuum. So I tried to demonstrate how to loop it over the hook by looping the cord in oval around the hooks on the back of the vacuum. But each time he tried, he would loop it over the top of the hook from the opposite direction, like a figure 8 instead of an oval. I guess ultimately that could have worked just as well, but as it was, he was then getting messed up at the bottom of the loop and not able to get the cord to catch the bottom hook and to lie neatly against the back of the vacuum. Eventually the cord and vacuum got put away. Does it matter that it wasn’t a neat clean oval loop? Not really. Did the whole experience help me learn that I need to find new, more verbally based, ways of communicating the “How tos” of everyday life, Yes! 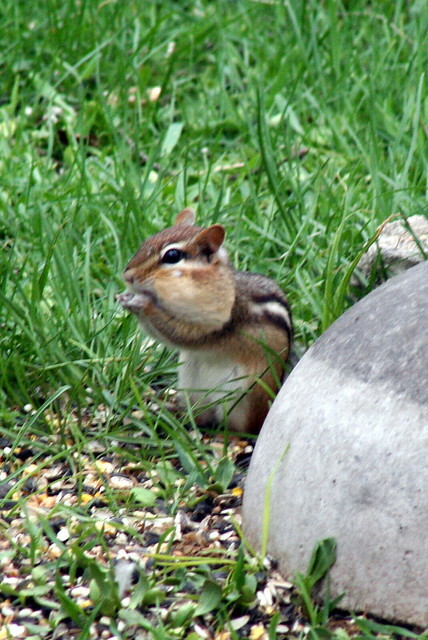 A couple of years ago I wrote an article on Hubpages about How to Get Rid of Chipmunks in your Yard (alert: if you really LOVE chipmunks, don’t read to the end of the article). I had always liked the little creatures, until huge numbers of them infiltrated my yard and garden and destroyed so many of my plants. This post is not about how to get rid of the little beasties, but instead about some interesting facts I noticed in the Google Analytics on the Hubpages article and on Google Trends. I wrote the article in 2011 and most of the traffic to the page at that time came from NY and CT. Then in 2012, most of the traffic came from MA, NY and PA. And in 2013 the majority of the visits are coming from OH. I’ll check again next year and see if anything new and interesting pops up in the data.